Kidney transplant is a Surgery to place a donor kidney in the body. 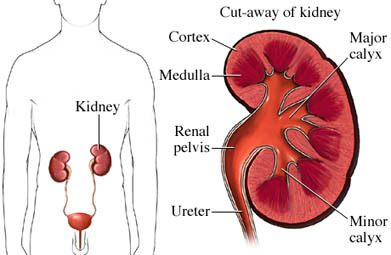 The new kidney will take over the job of the damaged kidneys. The kidney may come from a living donor or from someone who has died. A kidney transplant is a treatment option for people who have kidney failure . Kidneys perform vital work for the body. If they cannot work as needed it can lead to severe illness and death. The donor kidney can take over the work that the damaged kidneys can’t do. A transplant may also be done in people who had both kidneys removed. Continue dialysis as instructed by your doctor. Talk to your doctor about any medicine you are taking. You may be asked to stop taking some medicine up to one week before the procedure. Take medicine as directed. Do not take over-the-counter medicine without checking with your doctor. An incision will be made in the lower belly. The donated kidney will be connected to blood vessels. Blood flow can then pass to the new kidney. The tube that carries the urine to the bladder will also be attached. The diseased kidney will often be left in place. It may need to be removed if it is causing problems. It may also be removed if more room is needed. The surgeon will close tissue at the incision. The new kidney may start making urine right away or within a short time. Anesthesia will prevent pain during surgery. There will be discomfort after the procedure. Medicine will help to manage pain until you have healed. The usual length of stay is 1 to 2 weeks. Your doctor may choose to keep you longer if you have problems. Get out of bed. Often starts the day after surgery. Breathe deeply and cough 10-20 times every hour. This will help your lungs work better after surgery. Take medicine to decrease your immune system. This medicine will need to be continued for the rest of your life. It will reduce the chance that your body will reject the new kidney. Wear special stockings. They may reduce the risk of blood clots that can form with bed rest. The new kidney may help you feel better overall. Many will start to feel better within the first few days. Your new kidney will need to be monitored. Your doctor may ask you to check your weight and urine output. You will need to go to regular doctor visits and tests to make sure the kidney is working well. It is also important to let your doctor know if you have changes in urine output, weight, or signs of rejection. Pressure to the new kidney will need to avoided. Some activity will be limited. Driving will also be banned until your doctor has cleared you. There will be some limits to your diet but not as many as you had for dialysis. Akbar SA, Jafri ZH, Amendola MA, et al. Complications of renal transplantation. RadioGraphics. 2005;25(5):1335-1356. Chronic kidney disease (CKD) in adults. EBSCO DynaMed Plus website. Available at: http://www.dynamed.com/topics/dmp~AN~T115336/Chronic-kidney-disease-CKD-in-adults . Updated August 23, 2016. Accessed August 29, 2017. Greco F, Fornara P, Mirone V. Renal transplantation: technical aspects, diagnosis and management of early and late urological complications. Panminerva Med. 2014 Mar;56(1):17-29. Immunosuppression in kidney transplantation. EBSCO DynaMed Plus website. Available at: http://www.dynamed.com/topics/dmp~AN~T912632/Immunosuppression-in-kidney-transplantation . Updated July 24, 2017. Accessed August 29, 2017. Kidney transplant. National Kidney Foundation website. Available at: https://www.kidney.org/atoz/content/kidneytransnewlease. Updated January 26, 2017. Accessed August 29, 2017. Kidney (renal) transplantation.Urology Care Foundation website. Available at: http://www.urologyhealth.org/urologic-conditions/kidney-transplant. Updated January 2011. Accessed August 29, 2017. 11/30/2010 DynaMed Plus Systematic Literature Surveillance http://www.dynamed.com/topics/dmp~AN~T115336/Chronic-kidney-disease-CKD-in-adults : Stock PG, Barin B, Murphy B, et al. Outcomes of kidney transplantation in HIV-infected recipients. N Engl J Med. 2010;363(21):2004-2014.